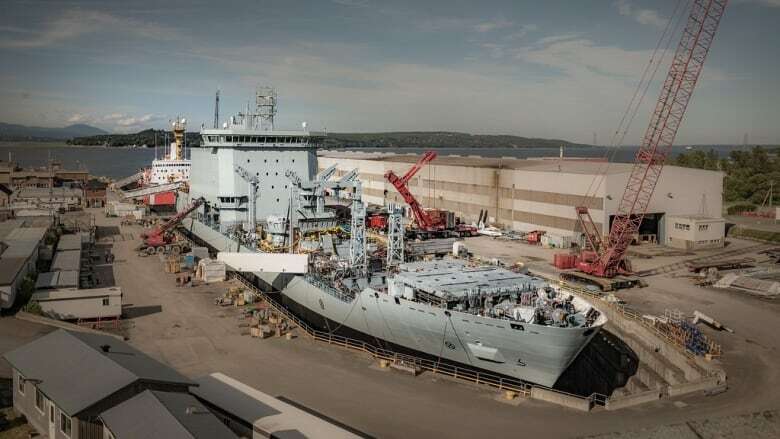 The estimated cost of building two new supply ships for the Canadian navy has climbed to $3.4 billion, an official in the procurement minister’s office said Tuesday. The MV Asterix, the navy's temporary supply ship, being refitted at the Chantier-Davie Shipyard in Levis, Quebec in early July 2017. The estimated cost of building two new supply ships for the Canadian navy has climbed to $3.4 billion, an official in the procurement minister's office said Tuesday. That's a $1.1 billion increase over the last projection for the Joint Support Ship program, which is years behind schedule. Delays in the program are at the heart of a criminal charge against the country's second-highest military commander, Vice-Admiral Mark Norman. He is accused of breach of trust for allegedly leaking cabinet secrets in relation to a contract to acquire the navy a leased replenishment ship to cover the gap while the military waits for the new supply ships to be built. Separately on Tuesday, Ottawa was buzzing about the possibility that the Liberal government was close to a deal to acquire a small fleet of medium icebreakers for the Canadian Coast Guard. But it's the escalating price tag on the navy's permanent supply ship program that will draw the most political heat. A spokesperson for Public Services and Procurement Minister Carla Qualtrough referred questions about why the cost escalated so dramatically to National Defence. The Parliamentary Budget Officer estimated some time ago that the program's cost eventually would exceed $4.1 billion for two ships — an assessment dismissed at the time by both defence and procurement officials. However, defence and budget planners went back and looked at the way the PBO's office costed its projection, and have now revised their estimate, said Pat Finn, who is in charge of purchasing at the Department of National Defence. "We have marched half way to the PBO number," he said. "We recognize that and acknowledge it." The higher price also reflects the cost of delays as materials and labour become more expensive. Other costs have now been added in, including the expense of refashioning the jetties where the ships eventually will dock. Finn said that the final contract to be signed with the builder will not be for $3.4 billion. The cost of the ships represents only 60 per cent of the revised figure, said Finn — who said he was unable to guarantee that the final price tag won't be revised again. A defence analyst said there's good reason to believe Canadians have not seen the final price tag because the design is still subject to revision. Dave Perry, of the Canadian Global Affairs Institute, said the program's ever-increasing cost undermines the federal government's marquee shipbuilding program, which was introduced by the Conservatives but embraced by the Liberals. There should be some substantive public conversation, given the enormous sum involved, he said. "It would really be a good thing since we are headed toward election season, effectively, to get a sense of where that entire body of work is." Qualtrough was asked last week at a major defence industry trade show how much the vessels would cost. She and her officials said they were unable to provide an estimate at the time, but insisted the program had adequate oversight and it would not turn into a technical, bureaucratic and financial calamity similar to the federal government's Phoenix payroll system. The vessels are being built at Seaspan in Vancouver and likely won't be in the water until 2022 or 2023. The federal government recently approved a $66 million contract to begin cutting steel and constructing modules for the supply ships. Since 2004, the federal government has been trying to replace the navy's replenishment vessels, which are key to keeping warships at sea for long periods of time. On the eve of the 2008 election, the former Conservative government cancelled the first attempt to procure the ships because the bids exceeded the project's budget envelope. That failure led to the establishment of the national shipbuilding strategy, which saw Ottawa partner with two shipyards — Seaspan and Irving Shipbuilding of Halifax — for long-term construction. Neither yard was fully ready; they had to endure hundreds of millions of dollars in upgrades before they were ready to start work. "We've learned from the past," Qualtrough told reporters last week. "The ideas we had in the past inform how we're going to move forward." Seaspan is expected to build the coast guard's heavy icebreaker, but delays in the naval supply ship program have pushed the commencement of that project off to the mid-to-late 2020s at the earliest. To cover an anticipated gap, the Liberal government started negotiating with Federal Fleet Services, Inc., the company running the Davie Shipyard, to provide three converted commercial icebreakers. Sources close to the discussions said a preliminary agreement was expected to be signed last week — something that would have secured up to 800 jobs in Levis, Que. ahead of the coming provincial election. The promise to acquire the icebreakers through Davie was made by Prime Minister Justin Trudeau last winter and, sources say, officials have scrambled to cobble together a deal. The shipyard is the same one that provided the navy supply vessel MV Asterix — the subject of the contract that is at the centre of the Norman court case. Sources said Davie hoped to follow a lease deal for those icebreakers similar to the one used for the Asterix, but the federal government is leaning toward acquiring the vessels outright.